Bubba's Excavation Company is a redemption product in a two player cabinet design. 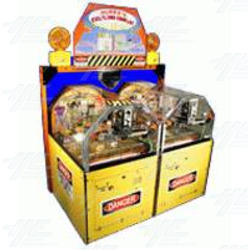 The machine consists of a moving ramp and on each side of the cabinet are five jackpot slots. The object of the game is for players to try and get their coin or token into one of these jackpot slots, at which point a bulldozer will move forward and tumble the coins and tokens over the edge to dispense tickets. When the player can get their coin or token inside the middle slot, a four-digit progressive jackpot will be awarded.